The Spring 2011 anime season has begun, and it couldn't have happened a day sooner! Now that the birds are back and the buds are starting to bloom, we're taking a new approach to seasonal reviews here at AniMaybe. We'll hit you with our impressions regarding the first episode, then update you with impressions in the middle of each season. 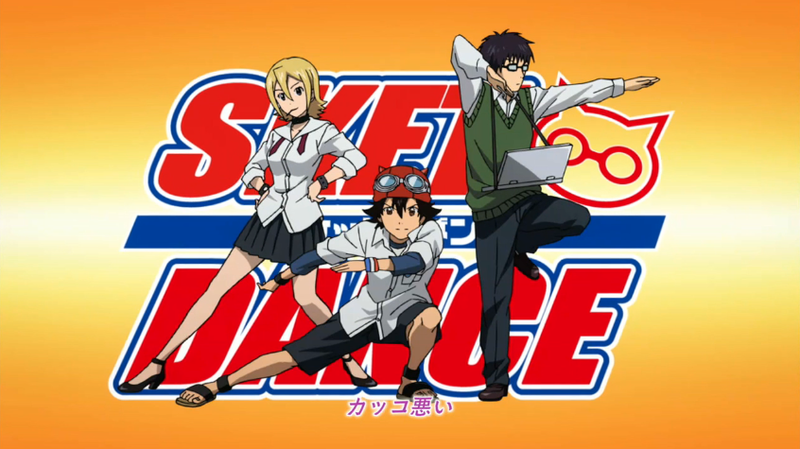 Today, we introduce SKET Dance, a Shônen Jump TV series from Tatsunoko Production and TV Tokyo. In the halls of Kaimei Academy, there exists a trio of students whose main job is to make sure that school life is a pleasant one. 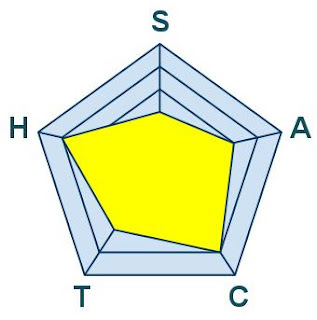 This "helper group" (suketto in Japanese) follows a personal mantra of "S.K.E.T. "—"Support, Kindness, Encouragement, and Troubleshoot (sic)". Therefore, the "Sket-Dan" exists to serve, only to be considered one of the insignificant clubs out there, rarely given glamorous cases. This lack of attention also means that membership is a concern, so Priority #1 for the Sket-dan is recruitment, the squad attempting to get lowly transfer student Teppei to join their ranks. While pressure forces Teppei to withdraw, he returns to them for help with a bullying problem, as there appears to be a student terrorizing the school with pranks involving spilled paint. 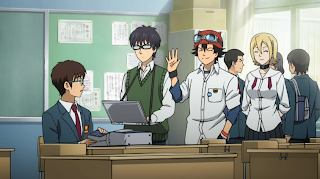 While the Sket-dan may be composed of less impressive students, as a unit they manage to get to the bottom of the problem through deduction...and a little violence from the group's Amazon. SKET Dance is a sort of story we have seen before in anime and manga, with eccentric characters organized into a small unknown high-school club for the sake of helping others out with problems. We saw a pretty good example of a sort of "Good Samaritan's Club" in last year's Ôkami-san to Shichinin no Nakamatachi, and one could also argue that the "SOS-dan" from The Melancholy of Haruhi Suzumiya resembles a sort of rescue committee. Volunteer clubs are a dime a dozen in real life and in animation for Japan, so it shouldn't count for anything exceptional in this case. The series will likely depend on its organization of characters before diving into a deeper plot. The animation of SKET Dance has been left for the experts at Tatsunoko Production, still going strong after almost fifty years in the business. While there is a moment where the use of computer technology just doesn't jive with the rest of the show (a chase scene in the hallways doesn't convey a three-dimensional perspective that well), the animation is generally smooth. For a simple series like SKET Dance, you won't be getting elaborate fight scenes and character galleries for the Louvre, but it gets the job done. Shônen Jump has always depended on the interaction between members of a semi-cohesive unit to tell its story. SKET Dance is no exception, but the characters really make this show stand out. Switch is a stoic computer geek who lets his laptop do all the talking, Himeko is the group's Osaka-dialect "Amazon" that uses muscle in the form of a field hockey stick, and Bossun, the unofficial leader, has the uncanny knack of appearing like a blabbering idiot, only to have concentration skills far beyond many at the school, donning his goggles to "Connect". By themselves, they are unexceptional, but the comedic give-and-take between the characters makes them funny to watch. The only precaution is that this organization could get old. The interaction between Himeko and Bossun could delve into Naruto/Sakura territory if we're not careful, and considering mangaka Kenta Shinohara worked as an assistant under Hideaki Sorachi, the mangaka for Gintama, the two-on-one ratio of dim bulbs to straighter heads seems awfully familiar. There is some good music and voice acting here; I'm totally in love with Himeko's (Ryôko Shiraishi) Osaka dialect and the dulcet comic tones from Gintoki Switch (Tomokazu Sugita). Some good musical composition from former deejay Shûhei Naruse makes for easy listening, albeit not so memorable. Of course, people should be going all waku-waku over the return of The Pillows to animation, but the ending theme has yet to be unveiled. This season has a total of seven Shônen Jump shows involved, so the hype machine has been on overdrive. The marketing of the show has been pretty solid so far—of all the websites for the new shows of the season, SKET Dance's website is the one that looks the sharpest, and its reputation as a good manga preceeds it (20 volumes so far). Of course, we shouldn't judge only on marketing alone, as the show has pulled in a capable director in Keiichiro Kawaguchi (Hayate the Combat Butler, Zettai Karen Children). Shônen Jump is certainly going for broke by flooding the market with a ton of its products, so there's a little trepidation regarding SKET Dance. It could easily be drowned out by Naruto, Bleach, and One Piece. It could be easily usurped by the performance of Toriko and the new season of Gintama. However, judging by the first episode and how entertaining the production staff has managed to make a simple school investigation, there's hope that the series can survive. 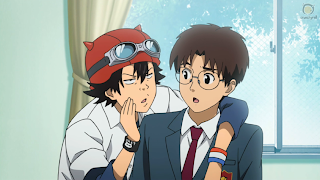 The characters make for a fun watch without becoming parodies of themselves, and it should be interesting to see how the show decides to focus on the individuals in Sket-dan. I'm hoping that even an average Shônen Jump show is worth something this season. I just fear that searching for that needle in the haystack will be harder with so many needles already put in the hay. F1RST IMPRESSIONS: Yondemasu yo, Azazel-san.